Shop at Amazon Smile and Support the PSA! In 2018, the Arlington Cultural Council, under the auspices of the Massachusetts Cultural Council, awarded the Chorale a $1000 grant towards the funding of the Chorale’s Almost Spring Concert titled, Through the Glass Ceiling: Six Centuries of Choral Music by Female Composers. This unique choral concert, featuring all women composers, included a small sample of a very rich musical output from various musical periods. The earliest work dates from the late 1500’s. The most recent is a 2017 newly commissioned work, and this concert was its premiere performance. The American Prize is a set of annual nonprofit national competitions in the performing arts which recognizes and rewards commercial and noncommercial recorded performances of classical music in the United States based on submitted applications. This year the 3rd Place American Prize in Orchestral Performance/Community Division was awarded to The Arlington Philharmonic Orchestra, Arlington MA, Orlando Cela, music director and the 3rd Place American Prize in Orchestral Programming/Community Division was awarded to Orlando Cela, Arlington Philharmonic Orchestra, Arlington MA. Click HERE for the results of this year's fantastic competition. 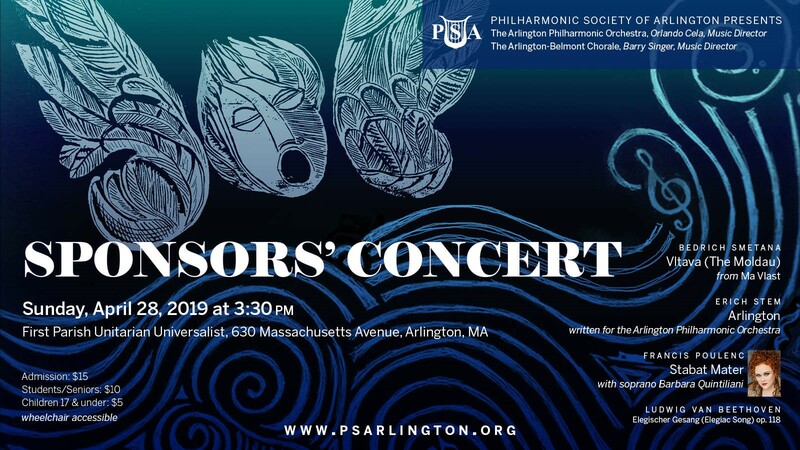 The Arlington-Belmont Chorale is a member of the Greater Boston Choral Consortium, a cooperative association of diverse choral groups in Boston and the surrounding areas.